Time Tracking is important for any business, whether it’s large or small. It’s also an incredibly useful tool for freelancers that know how to use it right. Time-Tracking apps help businesses of all sizes, consultants, and freelancers measure and increase their productivity. It does so by monitoring what you do on your work time and tracking time spent on tasks. They also offer you reports to give a better overview of your time habits, so you could work on them. You can find many time-tracking applications out there, and most of them offer the same features. However, not all time-tracking apps are created equal, and today we want to help you get a step closer to choosing the right time-tracking app for you. RescueTime, Harvest, and Toggl are three of the biggest names in the world of time-tracking applications and for good reasons. They are all excellent at what they do, but to decide which is best for you and your business, we need to delve a little deeper. RescueTime is a time management solution that monitors your computer use accurately so you could measure your productivity. It tracks your computer activities, websites visited, and programs used, categorize them and analyzes them so you could see how you spend your time. RescueTime also offers more advanced features such as measuring phone calls, meetings, and breaks. You can also view extracted information in detail or summarized, graph the data od the day so that users can check their productivity and assess it. RescueTime also offers on-screen reminders to help users remain on the right track and a website-blocking feature to help them focus on important tasks. Toggl is a user-friendly time tracking software designed to offer a useful overview of time spent on tasks, so users can assess their productivity and help companies make more accurate billings as well as payments. 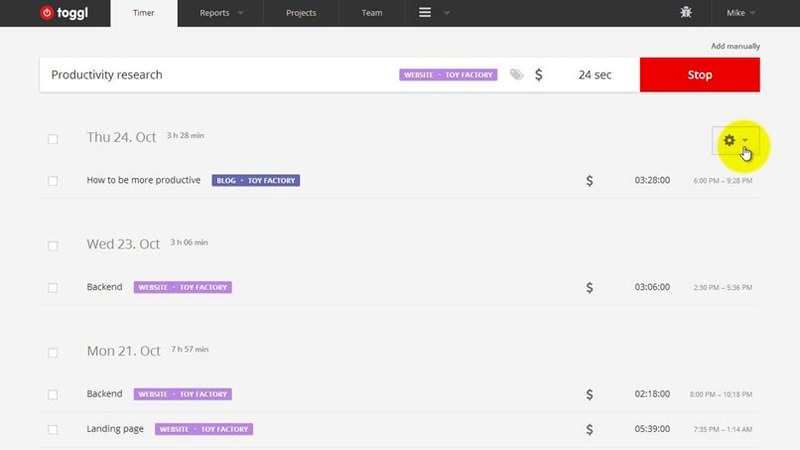 Toggl is most popular among freelancers and small businesses thanks to its sleek design and user-friendly interface. Toggl allows you monitor your browsing activities, idle time tracking, keyword tracking, and it offers the option of reminders as well. With Toggl you can also tag time entries for group activities. Harvest is an excellent business management tool that provides useful time tracking capabilities. The solution allows users to monitor personnel time, generate professional-looking invoices and send them directly to customers, and get all the information they need for better-informed decisions thanks to its reporting capabilities. Harvest is user-friendly and very light which makes it super-fast. The solution takes a direct approach to streamline the time tracking process to make it as smooth as possible. RescueTime’s strongest point is its accuracy. It can track monitor the exact amount of time in applications, websites, documents, and other computer activities. The tracking is done to the second and to the specific websites, documents, and such that you spend time on. A Team that uses RescueTime is able to monitor the activities of each team member so that managers and project leader are able to assess the productivity of each team member. Since RescueTime is a time-management app and not only a time-tracking app, it has tools to help its users stay focused on their tasks to reach their goals such as goal-setting properties, task-tracking features, distracting websites-blocking abilities, and alerts so that you don’t spend time on a task over than that you specified for it. The app is also flexible and provides different forms of data. You can see your data in detailed-reports or condensed summaries, and tasks can be categorized, and projects and activities can be customized and custom-categorized. RescueTime can also track offline time such as time spent on commuting, meetings, and phone calls. RescueTime also provides the option to pause or quit monitoring for users that find the idea of extensive-tracking to be a bit intrusive or intimidation, or for just when you need a break from it all. Toggl offers single-click time tracking through which you can start tracking time with a click and stop time-tracking with another. It also tracks time while you’re offline and will synchronize the data to the cloud once you are back online. Toggl’s three-stage hierarchy helps you stay on track by keeping everything organized, and the data is backed up every 12 hours to the cloud. Toggl integrates with third-party apps and services such as FreshBooks and Basecamp. The service is cloud-based, and data is backed-up every 12 hours and duplicated. Toggl also synchronizes data real time between its web app, desktop app, and iPhone and Android apps so you can track time on-the-go. Another big advantage of Toggl is that it’s open-source, making it easier for developers and users to build different third-party integrations to suit their needs. Harvest is designed to make it easy for users to keep track of their resources and stay on top of things, no matter where they are in the world. With Harvest, you can be in control of your time tracking process and have the ability to update your weekly timesheet with a few clicks. Harvest’s automated notifications remind the staff of their time reports to increase productivity. Management Personnel who use Harvest are able to more easily manage and distribute time efficiently across their business, increase the productivity, speed up the sales cycle, and boost the revenue of their business. Integration with Basecamp, FreshBooks, and more. Both devices are web-based, so not only do they offer a desktop application and applications for mobile devices, but both would work on almost any device connected to the Internet, be it running Windows, Mac, Linux, Android, or iOS. RescueTime offers support via E-mail and Phone No. They also offer training. Toggle offers support only via E-mail. Harvest offers support via phone and Email. A Ticket system is available and they offer training as well. You can also try the free version first, and if you like what you see you can upgrade to pro later. Harvest offers three pricing packages, one of which is completely free. The Solo Plan costs you $12/month which is reduced to $10.80 per month if you go for annual billing. The Team Plan costs about $12/user/month and it goes down to $10.80 if you go for annual billing. We hope this comparison helped you choose between the two most popular time-tracking applications. If we were to sum it up, we can say that RescueTime’s accuracy and attention to details set him apart, while Toggl is more concerned with the professional part of time tracking (the billing part). If you found this article helpful, share it with friends. If not and you still have questions, feel free to leave them below and we will get back to you. Also, if you would like to check more time-tracking options, check out the Best 5 Time-Tracking Software.